Banana is one of the most nutritious fruits and the best part is it liked by most kids. I always like to use banana in different ways for my daughter and those recipes have been loved by all of you. You might remember the banana nut bread and atta banana walnut bread. 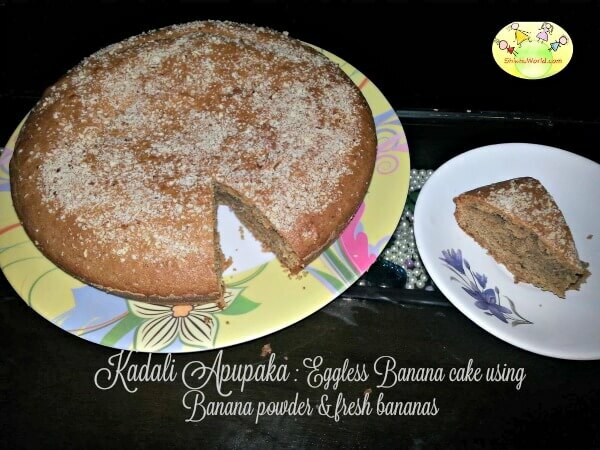 Recently I came across another recipe of eggless banana cake by a dear friend which is eggless and uses banana powder. It is such a great recipe that I just had to share it with you all. Gouri Tikota Kulkarni is mother to 3 years old Ved. She is an amazing person and I am fortunate to know her personally. Over to her!! We all know that bananas are a rich source of Vitamins and a great fruit for various health benefits. Sharing here is how I used bananas for making an healthy, eggless banana cake at home. Step 1: Take a bowl and mix the dry ingredients as follows: ‘Naimisha’ Banana powder, Wheat flour, Baking powder & Baking soda. Keep this mixture aside. Step 2: Wet Ingredients – Take butter in a bowl, add condensed milk and beat it well. Then add Elaichi/ elakki powder (quantity as per your taste buds) and half tsp Vanilla essence. Enhance the sweetness by adding about 2 table spoon brown sugar (may use white sugar instead). Add half cup milk and stir well. Step 3: Take ripe bananas and mash these nicely by hand or mixer. Mix this in the wet ingredients and stir well. Step 4: Slowly mix the dry ingredients (from step 1) in the wet ingredients. Augment the taste with sliced almonds or any dry fruit of your choice. At this point, add little more milk as per need, to bring the cake batter’s final desired consistency. Step 5: Grease and dust the baking tray to make it non-stick. Pour the cake batter into the tray and sprinkle the almond powder on the surface. Step 6: Preheat the oven at 180 degree centigrade and keep the tray for 25 to 35 mins (keep checking the readiness of the cake with a toothpick/knife). Take it out of the oven and cool it on the cooling rack. Then enjoy the soft, healthy and delicious banana cake! !